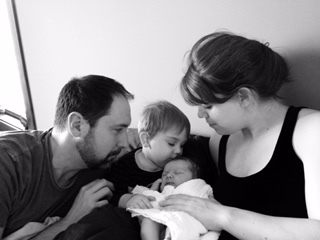 When my husband Nathan and I found out we were expecting our first child in 2012 we immediately decided on a home birth. With my husband being a chiropractor, we truly believe that the body is designed to work for you and functions at its best when there is less interference. Planning a homebirth meant that we had a better chance of a drug free "natural" birth, a healthy mom and healthy baby! Being pregnant for the first time I was excited but had normal concerns like any expecting woman. Early on in my pregnancy I had some bleeding and I was worried. I made my initial prenatal appointment at Mayo and met with the midwives a few times. We had also been searching for our homebirth midwife. We liked LeAnn right away and decided that we wanted her to be our midwife. For the first 20 weeks I saw both LeAnn and the Mayo midwifes. There was a distinct difference in the care I was receiving. I decided it was unnecessary to be under Mayo's care and did the remainder of my prenatal care with LeAnn. I really enjoyed my visits with her. Everything was so thorough from my nutrition, physical activity, physical changes, emotions, my relationship with Nathan and of course the baby and any questions and concerns I had about my pregnancy and upcoming birth. After my first few visits with her, I knew that she was invested in me, my baby and the best birth outcome. Around 5:00 p.m. both LeAnn and her birth assistant arrived at our house. I was getting tired and I remember LeAnn coming right up to me giving me a huge hug and kissing my forehead. I now felt more at ease and my labor continued to progress. I continued to labor for a while longer and around 8:00 p.m. I felt an urge to push. I was fully dilated and second stage labor began. I got in the birth tub and pushed for quite a while. After some time LeAnn checked me again and determined I had a cervical lip (tiny part of the cervix) covering baby's head. She was able to manually remove the lip and I continued to push. At 10:09 p.m. we welcomed our first child. I reached down and pulled our baby out of the water and onto my chest, a baby BOY!!! Benjamin James born at home, March 14, 2012 weighing 8lbs 5oz, 21 inches long. It was so amazing to just stare at this new little human, I didn't want to move. Once I delivered the placenta it was time to make sure everyone was doing well. I was bleeding quite a bit so LeAnn did give me a shot of Pitocin to stop the bleeding. I was a little nervous but LeAnn was so professional in the situation. After things calmed down a bit she examined both Benjamin and I. Besides helping me bring a healthy baby into the world, LeAnn and her team did an amazing job putting our home back in order, helping me establish nursing and calming my nerves about anything I was worried about. About four hours after his birth they left and I was over the moon about my empowering birth experience and new baby. Something that was provided with LeAnn's care was the constant care and checking up after Benjamin was born. She came back to check on us both the next day and then two days after that. We talked every evening on the phone for several nights following the birth. Just like my prenatal care, the postpartum care was just as thorough and personal . Once we completed our six weeks postpartum with LeAnn I really missed her but couldn't have been more happy with how everything went. By the end of summer 2013 we were expecting our second child. Of course we wanted to do a homebirth again since we had such a great experience the first time. Just like the first pregnancy I received excellent prenatal care from LeAnn. I had another great pregnancy and anxiously awaited the baby's arrival. Since I went into labor at 38 1/2 weeks I was expecting an earlier arrival from this baby too. But NO!!!! I was pregnant the entire 40 weeks! On Friday, April 25th I had a few contractions during the day but nothing that progressed. It was our 5th wedding anniversary so we had plans to go out for dinner. Around 7:00 p.m. I started having some regular contractions but still went out for dinner. By 9:00 we were home from dinner and I called LeAnn to let her know that I was in labor, I would put Benjamin to bed and call her back. I called her around 10:45 p.m. to let her know the duration and frequency of my contractions. I felt more in control this time since it was my second birth. She asked me if I thought she should come now and of course I was trying to hold out but her instincts told her to get ready and leave shortly. LeAnn arrived at our home a little before 1:00 a.m. My water hadn't broke but my labor continued to progress. She checked me and I was fully dilated I pushed for a few times and couldn't quite tell what I was feeling. When LeAnn checked me I once again had a cervical lip which she manually removed. At that time I think my water broke in the birth tub. With a few more pushes I reached down and pulled our second child out of the water, a baby GIRL!!!! Hazel Christine, born at home on April 26, 2014, 2:36 a.m., weighing 8 lbs 11 oz 21 inches long. Once again I had an amazing birth at home and wouldn't change my experiences for anything. I had wonderful postpartum care again and felt very supported and cared for even when I has a small issue a few days after the birth. Our decision to birth our children at home gave me a sense of empowerment, self accomplishment and inspired me to help other expecting mothers attain their birth goals. 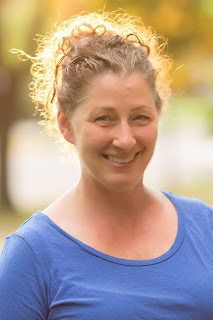 I am now a natural childbirth educator and believe that every woman should have the chance to birth her baby in the safest and best way she sees possible, with the ability to make her own choices with the support of an excellent provider . 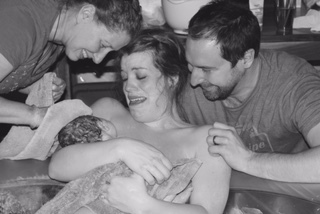 For my family our natural homebirths were just that!! !